OoooOooooo! It's even better than my "winning battle song" from final fantasy vii! I actually laughed out loud and my roommate had to ask what it was about. So I shared! Once, while walking through the airport, I heard a very distinct meow, repeated after a couple of seconds. I looked around, and saw a young man with a backpack, and at first I thought he must have his cat in the backpack. (They make a backpack with mesh inserts in it, specifically for use as a cat carrier. My son has one.) But after a moment, I heard the meow again, and the young man pulled his cell phone out of the side pocket of the backpack. 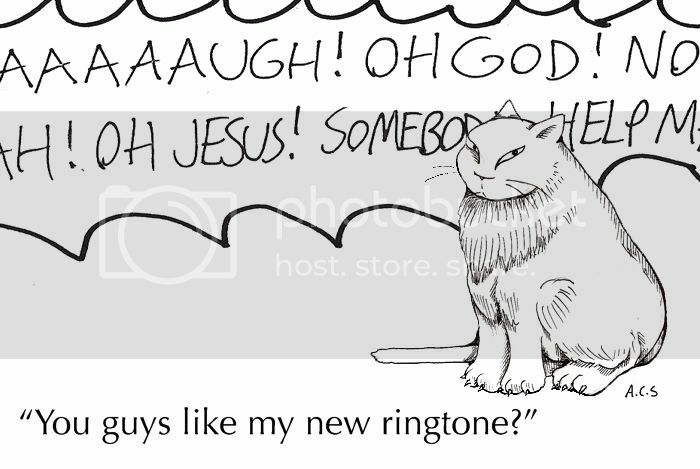 Yep, he had a very lifelike meow as his ringtone.